Seeing as it's Valentine's Day, I finished this last night, and I have nothing better to do, I'm writing a review! Why? Because I loved this book! I got it for my nook last week to keep me occupied while on a field trip but I got bus sick and had to stop. I finished it last night, or very early morning, and I've fallen in like with it. It was a fairly quick read. It's 256 pages as an actual book, but on my e-reader it was only 151, so pretty short. I think what first drew me to it was the name. 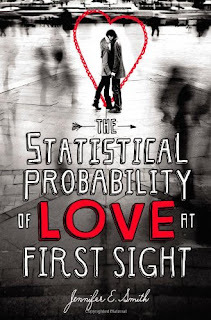 I mean, The Statistical Probability of Love at First Sight is quite a title and really fun to say. Plus you have to admit, the cover is extraordinarily pretty. There was a little too much reminiscing in the book for my tastes. It took me a while to get used to it, but I did eventually. I think it tried to hard to be philosophical. However, it was really well written Hadley (is it Had-lee or Heyd-ly?!) has some family issues and meets fellow lost soul on a plane ride to London for her father's second wedding, an event she'd rather not have happened. As far as romance goes, it wasn't heavy with it. There was enough to make it cute, but it was overbearing. This book basically happens with a two day span and I think the romance fits that. It's realistic and not to overbearing. It's short and reminds me a lot of "Miss Pettigrew Lives for a Day". Lives change in a surprisingly short amount of time. Oliver, a british exchange student going to Yale meets Hadley at the airport and helps her carry her bags. Even sits next to her on the flight! He's not prefect, but you love him, flaws and quirks in all. The settings weren't to die but I think helped to tell the story Smith was trying to get across. Basically the entire novel takes place in an airport, on a plane, in a subway car (for like a chapter), and a church, and at a wedding reception. Despite a few of its weird flaws, I REALLY loved this book. It might have been because it's Valentine's Day and I'm alone, or that I was sleep deprived when I finished it, but I just can't get enough of Hadley and Oliver! Why can't that happen in real life?!?! It's definitely not the most exciting love story, nor was it epic or passionate. What it was, was cute, fluffy, adorable, and really heartfelt. Not only do you fall in love with Oliver, but you grow with Hadley as she deals with her family issues. I teared up and smiled uncontrollably in a matter of a couple pages. "The Statistically Probability of Love at First Sight" is the definition of short, poignant, and incredible.